This page desribes groups and projects in Studio and how to manage those in high level. More about rule management and test file creation in other sections of this user guide. Groups you can think of as folders which contain projects. Projects in same group can also share some data like group rulesets. Projects are main thing to work with in Studio. Projects are always based on XML schema. Extra value is the built on top of the schema. This extra value consists for example of business rules and test file definitions. Based on rules and file definitions it is possible to produce validation functionality and sets of test files from a project. Also documentation can be generated based on rules and definitions. Navigation of groups and projects can always be found from the left hand side of the Studio user interface. You can open or close the menu from the blue part of the as seen in the picture below. Picture: myXML landing page after login group/project navigation open and closed. New groups can also be created from project creation popup as shown below in project creation section. You can edit the name of the group from the edit button of the menu which appears next to the groups name when hovered with mouse. You can delete the group from the trash can button of the menu which appears next to the groups name when hovered with mouse. Projects in Studio have many different settings which are mainly related to the behavior of validation functionality which can be produced from the rule data of the project. Guide Name of the external document to which the project data is based on. Content of this field will be shown in the validation service when validation functionality is published there. Wiki address Address to the wiki page where you can describe the contents of this project. Link to this page will be shown in the validation service when validation functionality is published there. Wiki page is accessible also to users who do not have access to myXML. Description Description of the project. Group in which this project locates. Pipe type Pipe type defines if some custom actions should be done before or after validation. File identification File identification can be used for detecting if file validated using validation service is good against the definitions made in this project. File identification is based on regular expression match, so you might for example search specific namespace from the file and if that is not found, then the file can be reported to be invalid. Schema usage You can select to use either one of the schemas from global libraries or upload your own. Encodings With this setting you define which encodings are accepted for the files which you validate. 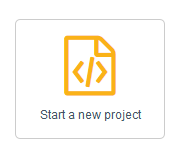 Fastest way to create new project is to click the "Start a new project" button at the home page of myXML. 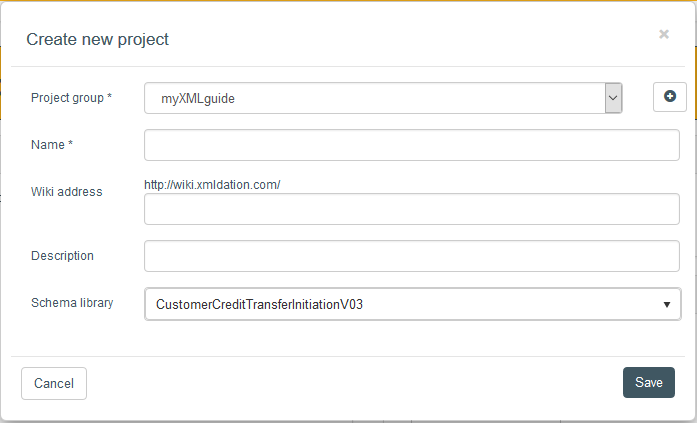 This opens up a dialog where you can select group to which the project should be created and also fill in the name, wiki address and description for the project. You must select a schema from the schema library, but you can change the schema later on from the project settings if you wish to use some other schema. Picture: "Start a new project" button and corresponding dialog. You can access the exportable project XML from the left hand side project menu. 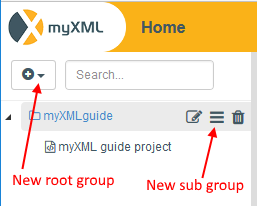 Hover the project with your mouse and open the hamburger menu where you see the "Project XML view". This is illustrated in the picture below. 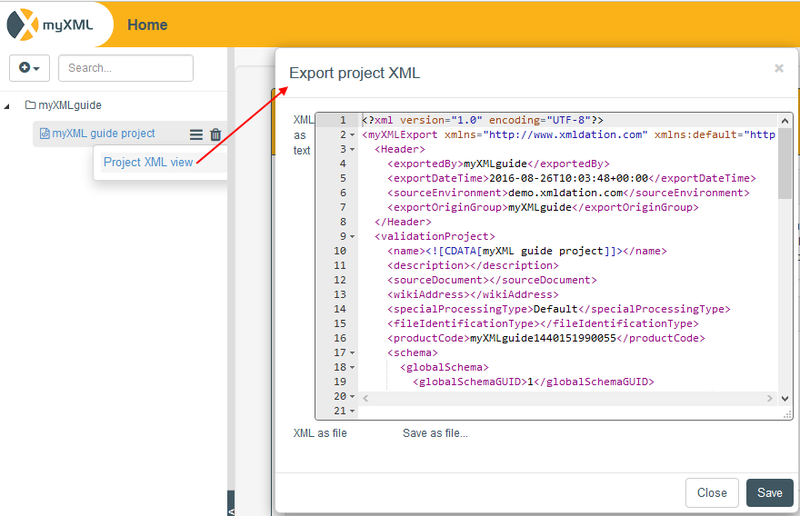 Another way to access the project XML is by opening the project and navigating to dashboard. At the bottom of the dashboard you can find "Export project" button. Importing also can be done from the left hand side project menu. This time you need to access the hamburger menu of the group to which you want to create the new project to. Hover to group and select "Import project" from the menu. Fill in the project XML you want. One thing to keep in mind: Each project must have unique productCode, so please change that from the project XML before importing. You can delete a project from the left side project menu by hovering the project and clicking the trash can. You can also delete project from the project settings page by clicking "Delete". Deleted projects cannot be recovered.